The story begins in 1960 when 18 year-old Rafael Zamarripa Castaneda won the Mexican National Sculpture award. He created the lovely seahorse statue that in the late 1960’s was originally placed at Las Pilitas, an outcropping at the south end of Los Muertos Beach. Everyone loved the statue and it became an icon and representation of the city then it was swept away in a storm. The sculpture was found and returned to Guadalajara for repairs. While in Guadalajara they lost track of the statue and in the meantime, a replica of the statue was made and unveiled in 1976. 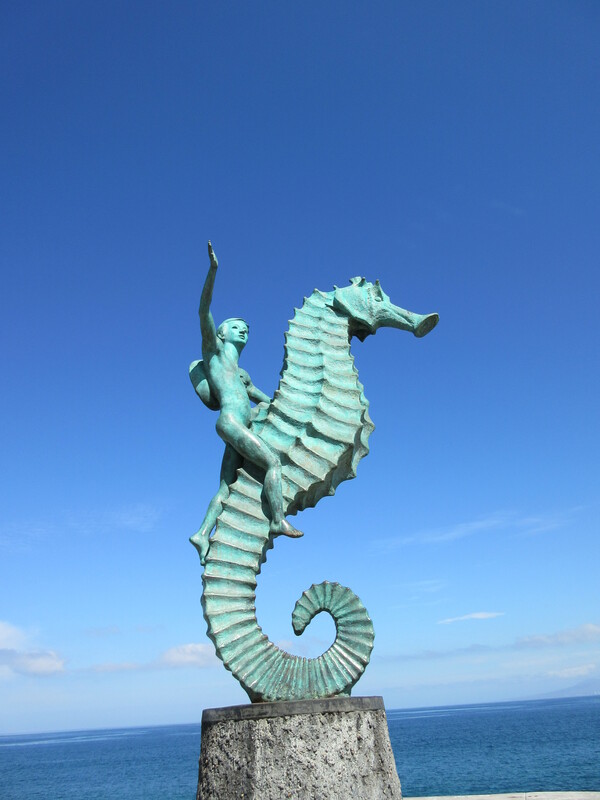 This replicated “Boy on a Seahorse” is the statue located along the Malecon, the famous walkway in downtown Puerto Vallarta. The original statue made in the 60’s was eventually retrieved and placed in the original location. It is hard to believe, but when Hurricane Kenna blew near town in 2002, the sculpture was once again washed away by the sea. Amazingly, the statue was again recovered and is once more on display. So what was lost is now found, replicated, and tourists and residents can now see two “Boy on the Seahorse” icons.